A remarkable hoard of coins shedding light on the power struggles between Vikings and Anglo-Saxons has come onto the open market in a highly unusual sale. This opportunity to buy items from the Eboracum (Ryedale) Hoard is so rare because coins of this nature are normally declared treasure under the 1996 act and go to museums. In this case, both the Yorkshire Museum in York and British Museum disclaimed the hoard - describing it as overvalued - and so the 65 coins and four ingots, found by two metal detectorists in a North Yorkshire field in 2012, went back to their finders. London numismatists Spink have catalogued the material in about 60 lots for their March 26 sale in London. Spink specialist Jon Mann said: "I can't think of a single find in recent times, at least since the Treasure Act was put into place in 1996, where something of this magnitude and period has not gone to a museum collection. In that respect it is a highly unusual thing to come onto the market." The hoard came to light in two separate batches - with several inches of soil between them - a week apart. One batch of coins is Viking in nature, dating to the 920s, and bridges the cultures that shaped England's history. For instance the coin on the catalogue cover features the Christian cross and Thor's hammer (estimate £7000-9000). 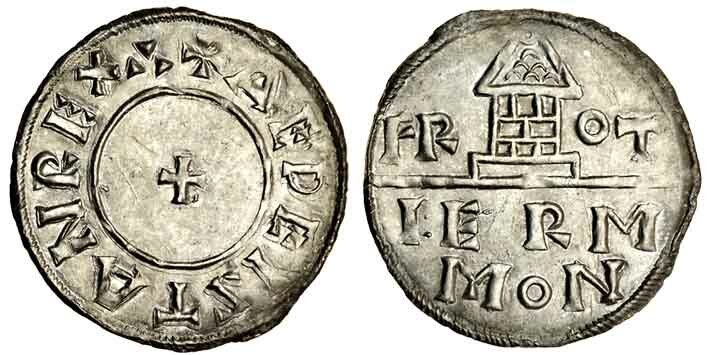 Other coins juxtapose the name of Saint Peter 'Sancti Petri Moneta' with a large Viking war sword. In July 927 the Anglo-Saxon king Aethelstan took the kingdom of Northumbria and styled himself Rex Totius Britanniae (King of all Britain), making him the first West Saxon king to have effective rule over the whole of England. The hoard includes coins displaying this title, its first record in British history. Aethelstan made a significant effort to eradicate all trace of Viking coinage at York and replace it with his own. The 'Church' type was the first struck at the northern stronghold. It is generally accepted that these coins show an Anglo-Saxon church but some believe that it may even be the earliest depiction of York Minster itself. It is this type of coin which gives the name of York in its Latin form, Eboracac, rather than using the Saxon name, Eoferwic. Mr Mann said: "We were obviously very keen to get the hoard and have worked on getting as much exposure for it as possible. Personally, I just wanted to make sure that justice was done to a collection like this so there was a record of the hoard while it is still intact, which is really what the catalogue serves to do as well as being an auction catalogue." Despite the importance of this find, the Yorkshire and British museums already possess a larger hoard from this era (the conquest of the Viking kingdom of Northumbria in 927 by Aethelstan): the £1.1m Vale of York Hoard discovered in 2007 near Harrogate. Including 617 coins, the two museums acquired it jointly in 2009 - and this influenced the decision not to buy the latest hoard, valued at £80,000. A British Museum spokeswoman told ATG: "Both the York Museum Trust and the British Museum expressed an interest in acquiring this Eboracum (Ryedale) Hoard, but both felt that it was overvalued by the Treasure Valuation Committee. "An additional element in both the valuation and in the priority we gave to this hoard is that so much of the material is represented, at rather better quality, in the Vale of York Hoard. The British Museum would ideally have liked to see this in a museum collection, but it was less important than it would have been if we didn't already have Vale of York." The Yorkshire Museum will exhibit the Vale of York Hoard in July. Neither museum revealed whether they would be bidding for any lots at the Spink sale.